Younger members of the ruling party - some technocrats and some opportunists - began to challenge the old guard. This group of younger government officials and business people aligned itself with Grace Mugabe and became known as the "Group of 40-Year-Olds", or "G40". As Mugabe's age (93 in 2017) caught up with him and his grip on power and his senses began to decline, the rivalry between the old guard and the Grace Mugabe/G40 faction intensified. 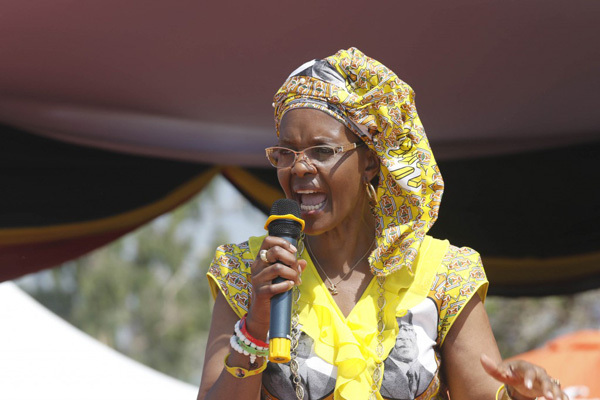 In 2014, Grace emerged as a serious political player, attacking then vice-president Joice Mujuru in public speeches, using vulgar language and expressions that shocked many Zimbabweans. At the same time, Grace's role as nurse and caretaker for her increasingly frail husband was growing. Mugabe was becoming more prone to falling asleep in public, mumbling and stumbling, and needing more frequent trips to Singapore and Dubai for medical attention. Chiwenga, however, was tipped off, and soldiers, disguised as baggage handlers, overpowered the police and prevented Chiwenga's arrest. On November 13, Chiwenga released a statement warning that the "purging" of Zanu-PF officials must stop. In response, a party spokesman accused Chiwenga of "treasonable actions." That was it. On November 14, there were reports of unusual movement of military vehicles on the northwestern approaches to Harare. That night, military forces took control of state television and radio and placed Robert and Grace Mugabe under house arrest at their residence. Security forces arrested or pursued a number of G40-aligned government officials. Some gunfire was heard in the city, and a few G40 officials sought refuge or went into hiding. On November 15, Major-General Sibusiso Moyo spoke to the people of Zimbabwe via state television and radio. He denied that there had been a coup and said that the military was "only targeting criminals around (Mugabe) who are committing crimes … that are causing social and economic suffering in the country". On November 17, Mugabe was allowed out of his home to preside over a graduation ceremony at a local university. On November 18, thousands of Zimbabweans took to the streets in peaceful demonstrations calling for Mugabe's resignation. On November 19, Zanu-PF dismissed Mugabe as its leader, but he was allowed to deliver a televised speech in which he was expected to announce his resignation as president of Zimbabwe. Much to the obvious consternation of the military officers sitting with him during the speech, he did not resign. Zimbabwean businesspeople believed Mnangagwa was pragmatic about business and investment and he would make good economic decisions. Civil society and media leaders perceived a greater tolerance for criticism of the government than had been the case under Mugabe. Chiwenga, who on November 13 had warned against purging Zanu-PF officials, became one of Mnangagwa's two vice-presidents and remained head of Joc. Moyo, promoted to lieutenant-general upon retirement from the military, who had taken to the airwaves on November 15 to re-assure Zimbabweans that no coup was underway, became Foreign Affairs and International Trade minister. Air Marshal Perence Shiri, former commander of the North Korean-trained Fifth Brigade, became Minister of Lands, Agriculture and Rural Resettlement. Lt Gen Engelbert Rugeje became the national political commissar for Zanu-PF. Two months before the July 2018 election, the deputy minister of finance, Terence Mukupe, said what everyone was thinking, that there was no way the military would allow the opposition to win. Still, the general impression among common Zimbabweans was that Mnangagwa brought improvement and, more importantly, Mugabe was out. The opposition was allowed to campaign in rural areas that had been off limits to them for years. People were less fearful of speaking critically of the government in public places. Perhaps most important to ordinary Zimbabweans, the predatory actions of the Zimbabwean police - seeking bribes at road checkpoints every few kilometres - stopped. What Mnangagwa and Zimbabwe needed to fully quell the coup/no-coup debate, or show that a coup could be a good thing, was a peaceful, transparent and credible election. Only through such an election - scheduled for July 31 2018 - could Mnangagwa's government be certified as legitimate.